Having proper posture assists in keeping our bones and joints in good alignment so that our muscles are used correctly, decreasing the abnormal wear and tear of the joint surfaces that could cause degenerative arthritis and joint pain later in life. Also, it is shown to reduce the stress on the ligaments holding the spinal joints together, lowering the chances of injury. Proper posture allows muscles to work more efficiently, which allows your body to use less energy and and lower the chances of fatiguing the muscles. Preventing muscle strain is also a perk to having good posture and will even minimize back pain. It may seem like a simple fix but having correct posture is a very important way to keep a healthy structure in the back and spine. If you are one who’s job requires a lot of sitting or standing for long periods of time, consider having some back support. If poor posture is not practiced, the anatomy of your spine will start to change and can possibly lead to constricted nerves and poor circulation. The first step is being aware of good posture. The more you are mindful of your posture, the less likely you will be to fall back into old habits of poor posture. 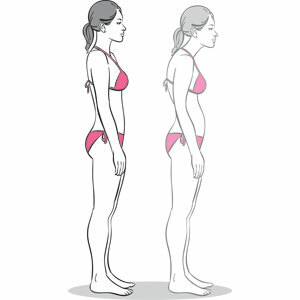 Stand in front of a mirror (better yet, have a friend take a picture of you), and observe how you look before and after correcting your posture. You can see that aligning your body in the proper way can give the appearance of losing a couple of pounds and can even make you feel more confident! Exercise: Pick a color . . . any color . . . every time you see this color, shift your attention towards your posture. Are you sitting up straight? Are you ears lined up with your shoulders? Every time you become aware of having better posture, you are taking important steps towards a much healthier future for your muscles, ligaments and bones! My spine is terrible postpartum (fractured tailbone, messed up SI joint, and crooked pelvis.) Such a nightmare. Great tips! Thank you! Katie – glad you enjoyed this post! Many women overlook the importance of maintaining proper posture during and after pregnancy…little reminders can really go a long way! As a physical therapy student, we learn all about the importance of good posture, yet I am guilty of slouching in almost all of my classes! I always try to challenge myself to be “2 inches taller” throughout the day as a reminder to straighten out my posture. What a great reminder for us all to strive to be “2 inches taller” throughout the day! Love it!